As we have come to expect with Susan Sleeman's books, this one opened off right away with excitement! Seriously, who wants to be in an arena with a bull that is intent on killing you? Tessa sure didn't count on that! Thankfully Braden knows about bulls and is able to distract the bull so Tessa can escape. Now the question is how did the bull get in the arena and who wants Tessa dead? Tessa McKade has followed in the footsteps of the McKade family and is in law-enforcement. She's also one of the contestants in the town's rodeo. Tessa holds the championship title for barrel racing. Braden used to be a professional bull rider. Now he is in law-enforcement as well. He is in town to help promote the rodeo and he arrives just in time to become Tessa's own personal body guard. Neither Tessa or Braden have an interest in a serious relationship. Tessa has sworn off men after a bad break-up and Braden watched his parents bicker all of his life and has no desire to be in a relationship like that. What Braden doesn't count on is the longing he has when he meets the McKade family. The love and respect they show for each other is something he has always dreamed of but never thought existed. And red-headed Tessa's feistiness sure is cute! Can the two of them put aside their aversion to relationships and admit they are attracted to each other? Rodeo Standoff was exciting from beginning to end! I'm definitely a fan of the McKade family and look forward to the next siblings story! 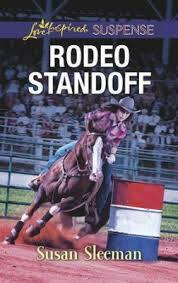 I loved the characters in Rodeo Standoff. Even though Tessa was a law-officer she was still mature enough to know when she needed protection and when to exert her independence. I thought the development of Braden and Tessa's relationship worked well and even though it had to be quick it seemed to run its natural course. There were elements of faith and mentions of faith, but it wasn't central to the story, just a part of who Tessa and Braden were. I definitely love the Love Inspired Suspense line of books. Just enough suspense and romance to keep the reader turning the pages.